Don't let the dry kibble in the bowl lull you into thinking their food prevents tooth problems. Unless it's a therapeutic food from your vet designed for dental health, dry foods at best help by only 10 percent, compared to canned or moist diets. Bacteria grow in left-behind food, mineralize, and form plaque. The bacteria also release enzymes that cause receding gums that loosen teeth, and redness and swelling (gingivitis). Eighty percent of pets end up with periodontal disease (decayed teeth, sore gums, bleeding mouths) by the age of three. Besides mouth and tooth problems, chewing pumps bacteria into the bloodstream and that affects your pets' heart, liver and kidneys. Truly, the best prevention is for your pet to have good genes. Tooth problems are inherited, and small dogs with crowded mouths (Yorkies come to mind) have more problems than others. Cats vary, but also can inherit a susceptibility to dental disease. When your dog struggles with tooth problems, the best way to maintain dental health at home is to brush your pet's teeth. Finger tooth brushes, gauze over your finger, or an infant toothbrush are appropriate choices. Human tooth paste isn't a good idea, because pets hate the foaming and must swallow the paste (they can't spit). Instead, choose a pet-friendly tooth paste. Chicken and malt flavors often will be accepted almost like treats by cats and dogs. Get your pet's mouth used to being handled over several weeks. You can flavor your fingers with the toothpaste, for example, so it becomes a pleasant experience. That allows you to easily transition to a finger toothbrush. Try propping the dog or cat's mouth open with a toy they like, and gently brush the outside of the teeth. Your pet's tongue takes care of the inside. Even if you're not able to brush after every meal, the enzyme action of pet toothpaste can be beneficial. There are also other helpful home techniques to help with pet dental care. Most veterinary dentists dislike cow bones, pig hooves, and other hard chew objects. These often are so hard the dog may break teeth. Instead, you can offer treats that pets must gnaw to encourage a natural scrubbing action that cleans teeth as they chew. Dogs relish raw veggies such as carrots and apples. Try freezing the carrots first. Cats aren't recreational chewers, but they do enjoy gnawing something tasty. Offer cats a hunk of cooked steak too large to swallow whole. Seren loves her meat treats, doesn't always finish it, but the gnawing helps clean those back molars. Dental "chews" for dogs can also help. Offer your dog a legal object that also has dental benefits, like the "dental toys" that contain a nubby surface designed to scrub the teeth. 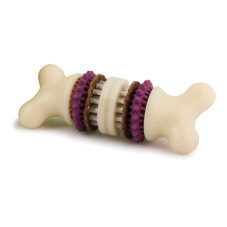 Dental "rope" toys can be squirted with a flavored doggy toothpaste to encourage gnawing. Some are infused with special enzymes that kill bacteria and help prevent plaque. Also look for dental rinse products from your veterinarian. There are many treats now available that claim to offer dental benefits. Some ingredients that kill bacteria that causes periodontal disease include chlorhexidine and zinc ascorbate. Treats that include these may indeed offer dental benefits beyond just the mechanical chewing action. Many of these products also contain chlorophyll or other breath freshening agents. Dental diets or treats may include sodium hexametaphosphate (sodium HMP) listed in the food ingredient list. Sodium HMP helps prevent plaque from attaching to teeth. The best dental diets and treats include a label that says it's been tested and proven to have benefit. Look for the Veterinary Oral Health Council (VOHC) Seal of Acceptance, which endorses such products. It is more expensive to do these tests, so such products generally cost a bit more. It's important to include a home dental check up every month for your dog and cat. Paying attention to the state of your pets' teeth and gums offers you a head start on getting the professional help they need. Much of a pets' dental problems remain hidden. Cats typically develop a type of cavity that develops at or below the gum line, and eats away the inside of the tooth. The urge to eat keeps most pets munching even with a sore mouth. Cats and dogs hide mouth pain very well. They often act depressed or irritable, though, and stop playing or even hide. You may think the behavior change simply reflects a pet's age when in fact a toothache makes him cringe and retreat from the world. While dental toys, treats and home brushing is great, nothing beats a professional dental exam and cleaning performed by your veterinarian. Don't wait until your pet is in pain; get routine care done as often as your individual pet requires. For some dogs, that's every year for a cleaning. Dogs and cats won't open wide and say "ah" so a tooth cleaning requires anesthesia. Xrays may be necessary to see those below-the-surface problems. Safe drugs can be used to keep even geriatric pets safe. Most general practice veterinarians provide ultrasonic scaling, polishing, and sometimes antibiotics and pain medication, especially if teeth are pulled. Keep both your relationship and your pets' breath smelling sweet. Between veterinary visits and professional cleaning, provide home treatments to keep pungent breath under control.